What effect will the Québec election have on Canadian federal politics? With all eyes on Québec’s election next Tuesday, federal Canadian politics has somewhat been on the backburner for the past month. But what are the consequences of the election in Canada’s second most-populous province for federal Canadian politics? By and large, federal politics is highly segregated from provincial politics. While there’s some overlap, provincial parties do not necessarily line up with national parties (for example, in Alberta, both the Progressive Conservative Party and the Wildrose Party are considered ‘conservative’ by federal standards and both parties attracted support from the federal Conservative Party in Alberta’s provincial election in April 2012). That’s especially true in francophone Québec — the province has greater autonomy than most provinces, historically leans more leftist than the rest of Canada, and features its own separate federalist / sovereigntist political axis that is unique to Québec. Nonetheless, a possible win by either of the three major parties — a fourth-consecutive term for premier Jean Charest and his Parti libéral du Québec (Liberal Party, or PLQ), Pauline Marois and the sovereigntist Parti québécois (PQ) or former PQ minister François Legault’s newly-formed Coalition avenir Québec (CAQ). — could affect federal Canadian politics in subtle ways. There’s little downside for the federal Conservatives in any case, especially considering that Harper hasn’t devoted time or effort to backing anyone in the Québec race. Charest, of course, once served as the leader of the federal Progressive Conservative Party in the 1990s before moving to provincial politics — the Progressive Conservatives ultimately merged with Harper’s Western-based Canadian Alliance in 2003 to become the Conservative Party. 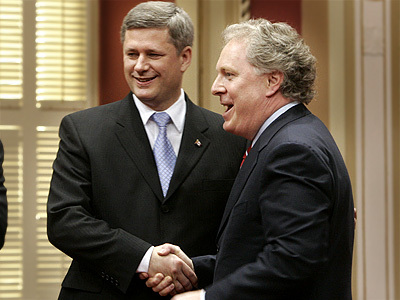 Although Charest has been a staunch federalist in nearly a decade of leading Québec’s government, he hasn’t always had the best relationship with Harper (pictured above, left, with Charest). That’s partly due to the tension between a provincial premier and a federal prime minister, but Harper, in particular, is still thought to feel somewhat burned after intervening on behalf of Charest in the final days of the 2007 Québec election. If voters support the parties in next Tuesday’s Québec election as shown in the latest Leger Marketing poll, it will be with a burst of support among francophone voters for the newly-formed Coalition Avenir Québec (CAQ). That poll showed, essentially, a three-way race, with the sovereigntist Parti québécois (PQ) leading at 33%, with 28% for the CAQ and 27% for premier Jean Charest and his Parti libéral du Québec (Liberal Party, or PLQ). Showing the volatility of the race, another poll last week showed Charest’s Liberals with a 35% lead to just 29% for the PQ and 24% for the CAQ. 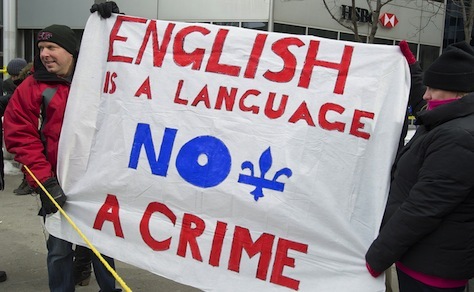 Although so much has been made of anglophone voters — and their openness to the CAQ — anglophone Quebeckers, which make up roughly 10% of the Québec electorate, are still mostly captive to premier Jean Charest and his Parti libéral du Québec (Liberal Party, or PLQ). Despite support from the prominent anglophone politician Robert Libman, the CAQ attracts just 15% of the anglophone vote to 67% for the Liberals (the PQ wins just 9%). 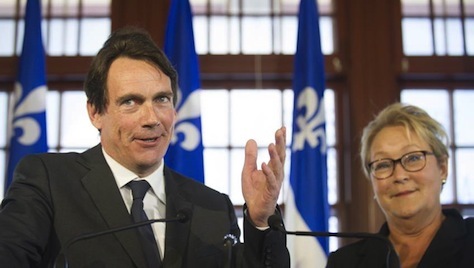 Francophone voters, however, split as follows: 38% to the PQ, 31% to the CAQ, 18% to Charest’s Liberals, 9% to the stridently leftist and sovereigntist Québec solidaire and 3% to the sovereigntist Option nationale, which received the high-profile support of former PQ premier Jacques Parizeau over the weekend. It should be fairly clear that the 12% of francophone voters supporting Québec solidaire and Option nationale would otherwise be supporting the PQ in this election. Remember that the first-past-the-post system means that the election next Tuesday will really be 125 separate elections in each election district, so in a close race, that 12% could make the difference. If the CAQ’s francophone support is coming predominantly from voters who have already decided that they won’t vote for Charest, the CAQ is competing for the same pool of voters as the PQ, which could ultimately lead to Charest pulling off a victory and a minority government. If the CAQ’s francophone support is coming from voters who, for whatever reason, are attracted to its centrist / vaguely free-market platform, the CAQ is competing with the Liberals, which could allow the PQ to win a minority government.